Read Michael Scaramozzino’s recently published book, Creating a 3D Animated CGI Short, which chronicles the making of The Autiton Archives™ series pilot webisode – Fault Effect™, for an in-depth behind the scenes tour of DreamLight’s unique 3D CGI short filmmaking production process, including 3D character design and animation techniques. See DreamLight Insight: The Autiton Archives - WIP Blog for some excerpts from the book including 3D Character Design and 3D character animation techniques. View DreamLight’s first award-winning 3D animated CGI short film — BlastOff!™, which screened at 15 international animation film festivals across the country while winning multiple awards. BlastOff! is a good sample of DreamLight’s character animation capabilities including 3D character facial animation. See DreamLight Insight: BlastOff! An Award-winning 3D Animated CGI Short Film for additional behind the scenes samples including 3D character animation techniques. 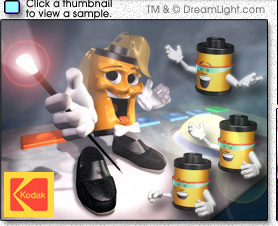 Kodak – Back when computer hard drives were still measured in mere Megabytes, Kodak needed a digital host, a 3D animated character, to demonstrate their Creation Station kiosk that would fit within the very limited data storage allocated on the kiosk. Kodak turned to the award-winning multimedia studio, DreamLight Interactive, to fulfill their specific project requirements. DreamLight designed and produced a concept test rendering of a new 3D animated character named Flip. Flip was a bit too radical a departure from an existing 2D character that Kodak already had in mind though, so we simplified the design into a 3D character, named Snapshot that was closer to their existing character. We then created limited-frame 3D animation of Snapshot to fit within Kodak’s allocated data storage constraints, and somewhat limited playback capabilities of the time, while we developed an interactive multimedia demo for the Kodak Creation Station kiosk. View DreamLight Insight: Simple 3D Character Animation for Kodak for a behind the scenes case study about this widely published project, complete with additional samples. To have DreamLight create 3D character animation for your next project, please contact us. View the DreamLight 3D Animation Demo Reel. DLI_SNUB-Launcher™ is an XCode Aqua GUI front end to interactively configure and launch LightWave 9, 10 & 11+ ScreamerNet UB lwsn instances for standalone, batch and network rendering. Download your copy today! Michael Scaramozzino - LightWave 3D Artist Profile.